This article was originally published by The Finance Navigator, a startup company which simplifies financial planning and cash flow management for other startups. 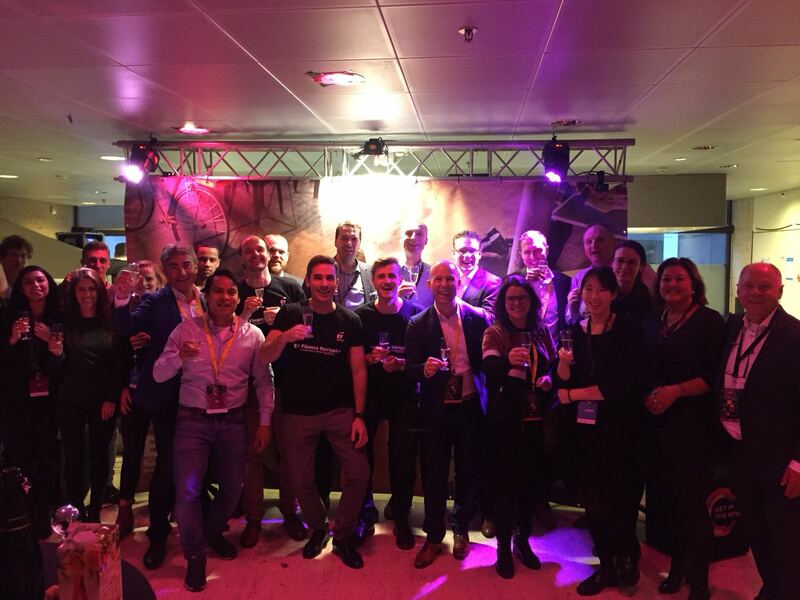 On Thursday the 16th of November, we launched EY Finance Navigator at the Rotterdam edition of startup pitch battle event Get In The Ring (GITR). By doing so, we have turned EY Finance Navigator into the first corporate startup ever launched by EY! In this article we’ll share key facts of the exposure we had, some highlights of the event and a couple of tips on how to launch a corporate startup at an event. 1. Demo, demo, and yes.. demo! Flyers, banners, T-shirts, our own lounge and some guerrilla-marketing tactics (more on that one a bit later) made sure that we were visible on the most important locations at the event: the entrance, the corridor that was leading towards the main area of the event (and where coffee and food were served) and, of course, on stage during the pitch battles of the startups. Not only did this massively increase the awareness of our brand among the event attendees, it also helped people find us when they were interested in learning more. Demos all day long! 2. A bit of guerrilla marketing. For this one, we need to provide some context. Two days after the GITR event the Dutch version of Santa Claus called “Sinterklaas” arrived in the Netherlands to provide gifts and sweets to children according to Dutch traditions. You have to imagine Sinterklaas is a (much) bigger thing than Santa Claus in the Netherlands and therefore literally (almost..) everyone loves him and the related public festivities. One of the typical types of candy Sinterklaas gives away is chocolate coins. So we decided to order 1500 chocolate coins, put stickers on them with a link to an EY Finance Navigator landing page and gave away a couple of free accounts to EY Finance Navigator if visitors of the landing page left their e-mails. We made sure those chocolate coins were literally everywhere and the GITR team actively helped us hand them out. Since everyone loves chocolate as well as Sinterklaas, the impact was huge: 40 new customer leads in the pocket! 3. A glass of champagne! During the event we had our own “special moment." We invited a group of colleagues, pilot customers and loved ones who have been of great support over the past year and a half, gave a small speech to thank the people who contributed most to our success and popped some bottles! Never forget to celebrate your wins, even the small ones! Launching a startup from within a corporate is great fun but also challenging, thus a good reason to celebrate! 4. We got 99 problems, but a pitch ain’t one! Of course, we also had our moment of fame on stage during the award show of the GITR event. 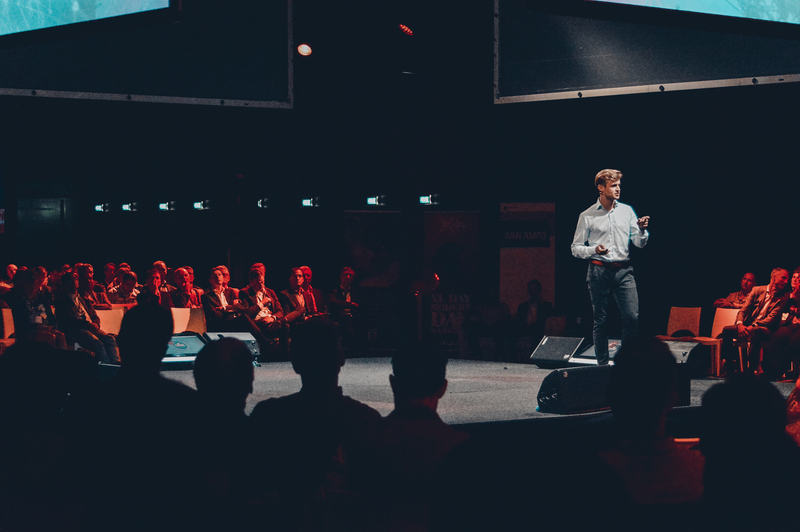 During the show 6 startups (selected during the day) battle each other on stage in front of an audience of several hundred investors, entrepreneurs, corporates and other startup enthusiasts. We gave away one year of free access to EY Finance Navigator to the winners of the battles. For that reason, we took the stage for 2 minutes to give away the free accounts, to pitch EY Finance Navigator and to emphasize our chocolate coin Sinterklaas action. Again, major awareness among all the attendees of the event in just 2 minutes! We did not yield all this exposure only by performing the activities described above. There are some benefits of being a corporate startup. Want to learn more on how we used those benefits to really have MASSIVE impact? Continue reading below this picture for some tips on how to launch a corporate startup at an event! The reason we decided to launch at Get In The Ring (GITR) is because it’s a startup event, meaning we were surrounding ourselves with potential customers. However, maybe even more important is that EY is a partner/sponsor of the GITR Foundation. Picking an event where you have a relationship with the event host helps a lot in trying to organize your efforts in such a way they are as visible as possible. If you launch at a random event where you have no relationship with the organizer whatsoever, it will be harder to get the exposure you’d like to have. However, don’t just assume the event host will give you anything you ask for, even if you have a good relationship. It helps to communicate clearly with the organization, take ownership of the activities/promotion you want to perform and make sure you have something to offer in return. We gave away a couple of free EY Finance Navigator accounts, for instance, which is nice for the event attendees (and therefore also for the event organizers). GITR gave us a stage in front of the full award show audience, our own lounge to perform our launch and helped us promote EY Finance Navigator among the event attendees all day long. So (again) a big shout-out and thank you to the GITR organization! A great benefit of working at a corporate is they are very organized, meaning people usually work in their own field of expertise. This makes it easy to identify colleagues specialized in certain fields, which might come in handy for your launch! We requested support from our external communication department, for instance. One of our colleagues from that department eventually supported us by writing and posting a press release about our launch. This press release was picked up by several media, which led to large volumes of visitors to both EY’s as well as our own website. This one is related to the previous one: ask colleagues for support! We invited several colleagues to our launch and asked them to help spread the word on social media. Before we knew it, all of our colleagues were tweeting, liking and sharing like hell, which turned out to be very powerful in combination with the press release that was sent out (which was, of course, shared by those colleagues as well). Working in a corporate gives you the power of a whole network behind you, so use that network! You will be amazed by the willingness of your colleagues to help you out, as long as you actively include them in your journey of corporate innovation. Show your gratitude towards the people who have helped you out, no matter how small their contribution has been! That includes everyone that supported you: your colleagues, the event organiser, and even loved ones or family who may have helped you make your launch a success. Your impact is only as strong as your network, so empower your network! You’ll notice this will help you keep momentum even if your launch is long gone already. Wout Bobbink is the co-founder and Chief Marketing Officer of the Finance Navigator – an in-corporate venture of EY. Wout and his team are both our colleagues and alumni – they went through the HighTechXL accelerator program, next to guiding our startups into the development of their financial models. Wanna know more about their experience? Feel free to reach out (thefinancenavigator@nl.ey.com). Interested in corporate innovation? At HighTechXL we've been working with corporates for the past three years, supporting them to build their businesses. Find out here how we can help you take your company to the next level through innovation and entrepreneurship.